Power banks or battery packs are something that we think most people should own. You don’t need to own a big 15,000mAh pack, by any means, but you never know when you might need some extra juice to power your phone in a pinch. 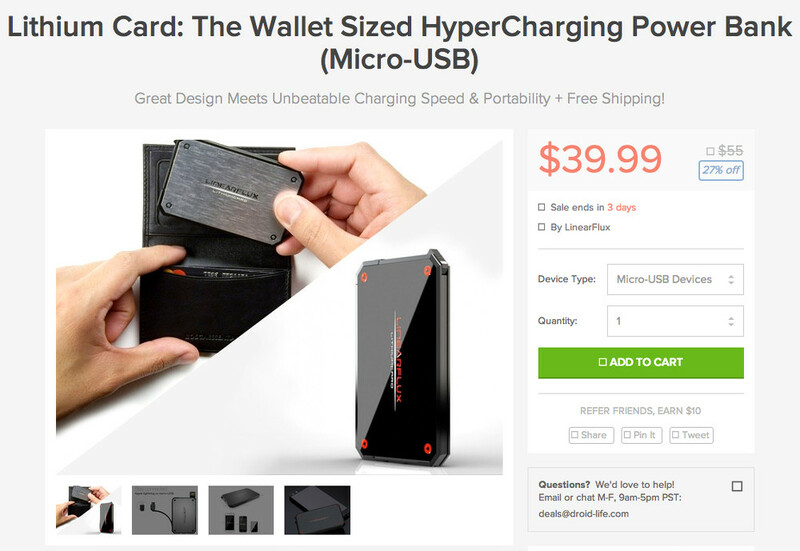 A power bank like the Lithium Card, which is currently discounted on our DL Deals site and was an Indiegogo sensation, is a great option for those without a big budget or a lot of room. The Lithium Card is a wallet-sized (5 credit cards thick) battery pack that holds 1,200mAh of power and can charge up to 1% of battery per minute. That may not be enough to get you a full battery refill, but some times you only need just enough to get you through the rest of a day. To see reviews, comments, and specs for the Lithium Card, hit up the deal link below.